12 Strong (film, 2018). A 2018 American action war drama film with "R" rating by Warner Bros. Pictures (United States)/Lionsgate (International). Directed by Nicolai Fuglsig. Official Trailer. 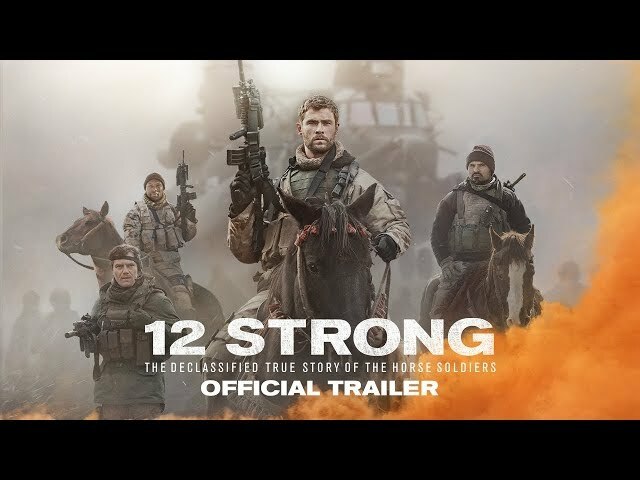 12 Strong is a 2018 American action war drama film directed by Nicolai Fuglsig. 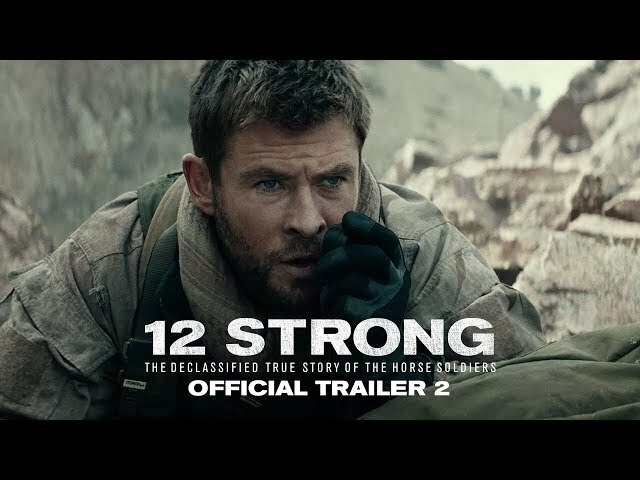 12 STRONG - Official Trailer 2. Mitch Nelson, a US Army Captain with Green Berets Operational Detachment Alpha (ODA) 595, is moving into a new home with his wife and daughter on September 11, 2001, after receiving an assignment to staff duty under LTC Bowers. As news of the devastating terrorist attacks that day break, Nelson volunteers to lead 595 into Afghanistan. Bowers initially refuses, but veteran soldier CW5 Hal Spencer, previously scheduled to retire, persuades Bowers to give Nelson command of 595 again, as well as volunteering himself for the deployment. After leaving their families, 595 travels to Uzbekistan on October 7, 2001. After being briefed and evaluated by COL Mulholland, Commander of 5th Special Forces Group, Nelson and 595 are picked to fight alongside Northern Alliance leader Abdul Rashid Dostum. ODA 595 is inserted covertly in Afghanistan aboard an MH-47 Chinook flown by 160th SOAR. They land 40 miles south of Mazar-i Sharif, the country's fourth-largest city and a longtime stronghold of the Taliban, where they meet Dostum. Six of the 12 members, led by Nelson, leave with Dostum to the mountains, while the other six remain in a fortified camp nicknamed "The Alamo" under Spencer's command. Dostum is attempting to capture the northern Afghanistan city, while battling Taliban leader Mullah Razzan, who rules local communities brutally under strict Sharia law, and has murdered several people, including Dostum's family. Although the warlord is initially skeptical of Nelson's abilities, Nelson gradually earns Dostum's respect. In one battle, however, Dostum makes a tactical error, costing several casualties. Nelson accuses Dostum of acting carelessly with the lives of his men and of withholding valuable information, while Dostum retorts that he still feels that Nelson, and the U.S., is not willing to pay the potential price of the conflict, and tells Nelson that he needs to use his heart and mind to "be a warrior" instead of a soldier. The two eventually reconcile, and, after splitting off a three-man element under SFC Sam Diller to strike a Taliban supply route, and being joined by Spencer's half of ODA 595, continue to work together. They win several victories with Dostum's leadership and manpower and American airpower, making significant progress towards Mazar-i Sharif. Suddenly, however, Spencer informs Nelson that another ODA, 555, has been dispatched to support Atta Muhammad, another Northern Alliance leader, who is Dostum's political rival. When Nelson is forced to tell Dostum, the furious warlord and his men promptly abandon 595. Principal photography began in early January 2017 in New Mexico. The film 12 Strong was scheduled to be released by Warner Bros. Pictures (United States) and Lionsgate (International) on January 16, 2018 (Jazz at Lincoln Center), on January 17, 2018 (Philippines), on January 19, 2018 (United States, Canada, Estonia, Taiwan) and on March 8, 2018 (Germany). The duration of the film is 129 minutes. With a budget of $35 million, the film grossed over $70.8 million. 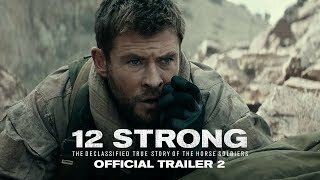 12 Strong got average rating from critics. But the audience likes the film. Audiences polled by CinemaScore gave the film an average grade of "A" on a scale ranging from A+ to F.